When you need to cover a large area, you need a high-capacity sprayer that is comfortable, powerful and fuel-efficient. With the SR 430 backpack sprayer, you can check off all those requirements and much more. 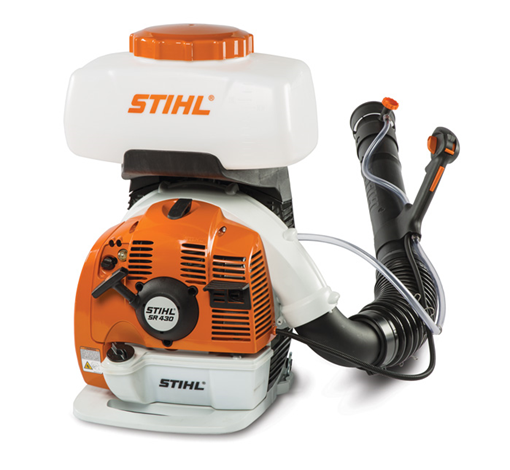 This gasoline-powered liquid-only backpack sprayer delivers a large spraying range, reducing the time it takes you to treat large areas. Its high performance pressure pump provides a constant flow of product with no loss of pressure, regardless of the spray angle. While the engine is running, the pump also continuously mixes and agitates the tank contents, delivering a more consistent application of product. The sprayer is also comfortable to wear, featuring an anti-vibration system, soft rubber grips and optional chest and hip belt accessory to evenly distribute weight. The SR 430 is ideal for farmers, foresters and pest controllers. The pressure pump kit is included for applications in which the spray tube is held at an upward angle of more than 30 degrees in order to maintain a consistent discharge rate.